From Mumbai (India), we are bracketed among the high-standing Manufacturers, Suppliers and Exporters of the Welding Electrodes across the globe. These Welding Electrodes are 100% compliant with the industry stated standards. To enhance resistivity and durability, only damage-resistant materials and most up-to-date technologies are utilized in the fabrication of the Welding Electrodes. 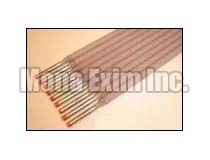 We facilitate the buyers by offering medium or bulk quantities of Welding Electrodes at economical prices.